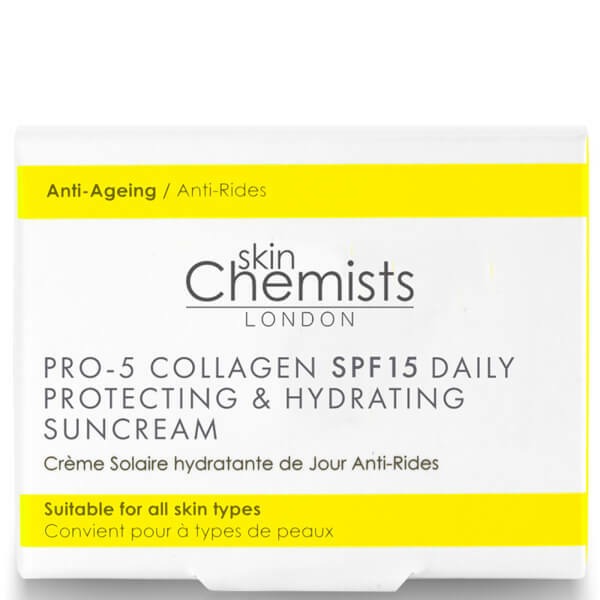 Provide your skin with nourishment and protection with the London Pro-5 Collagen SPF15 Daily Anti-Ageing Protecting and Hydrating Sun Cream from skinChemists. 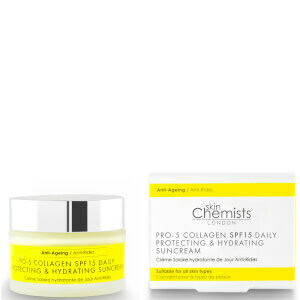 Infused with a potent blend of moisturising and hydrating ingredients, the sun lotion also defends against damaging UV rays and free radicals. 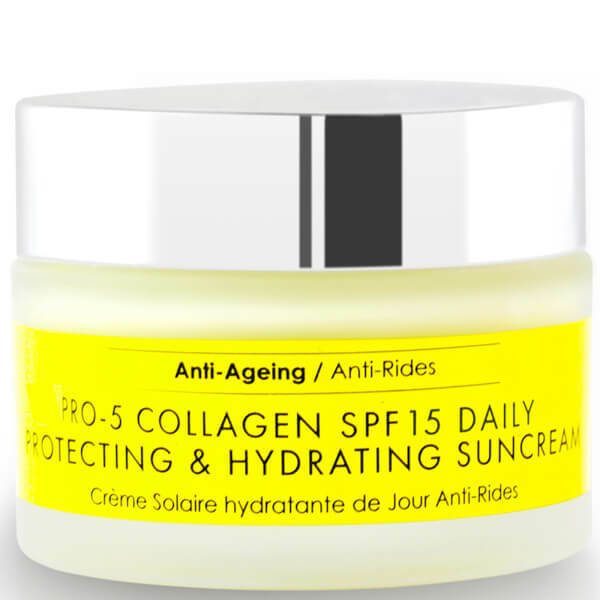 Enriched with Shea Butter to soften and smooth, Collageneer to firm the skin surface and Collasurge to restore moisture, the formula can be used daily and under makeup to promote brighter, glowing skin that holds long-lasting protection. 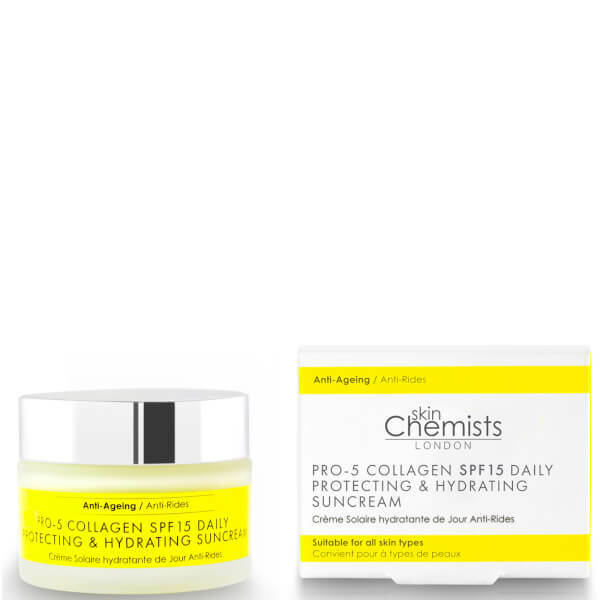 Aqua (Water), Octocrylene, Ethylhexyl Methoxycinnamate, Benzophenone-3, Homosalate, Isoamyl Laurate, Butyl Methoxydibenzoylmethane, Glycerin, Tapioca Starch, Cetearyl Alcohol, Butyrospermum Parkii (Shea) Butter, Benzyl Alcohol, C12-16 Alcohols, Helianthus Annuus (Sunflower) Seed Oil, Phenoxyethanol, Sodium Stearoyl Glutamate, Collagen Amino Acids, Palmitic Acid, Lecithin, Glyceryl Stearate, Polyacrylamide, PEG-100 Stearate, Xanthan Gum, Parfum (Fragrance), C13-14 Isoparaffin, Disodium EDTA, Sodium Hyaluronate, Tocopheryl Acetate, Dehydroacetic Acid, Polymethylsilsesquioxane, Laureth-7, Benzyl Salicylate, Lupinus Albus Seed Extract, Hexyl Cinnamal, Limonene, Ethylhexylglycerin, Potassium Sorbate, Tocopherol, Citric Acid.